Looking for garden plans that you can use in your own backyard? You've come to the right place. A lot of people are daunted by the prospect of starting a vegetable garden on their own and there's nothing wrong with that. There is a lot of information out there relating to starting vegetable gardens, but how do you sort through it? 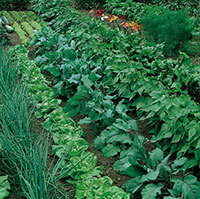 Location, Location, Location: The biggest consideration when starting your vegetable garden is where to put the garden. The location is going to have the biggest impact on how well your garden performs. Choosing the wrong location can take a perfectly good garden plan and ruin it quickly. 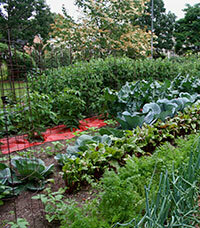 Let's explore the considerations when choosing a site for your vegetable garden plans! Size: The size of the garden is extremely important and should be decided on first before you do any digging or soil preparation. If you are researching garden plans, then most likely you aren't too sure of your own ideas so the best suggestion is to start small. Small vegetable gardens can still be very productive and they will give you valuable experience that you can take and expand upon later on. Sunlight: Generally the best location for your vegetable garden plans is one with a southern exposure that is also free of any obstructions such as trees or buildings. This will maximize the exposure your vegetables will have to the vital sunlight. Ideally you want the vegetables to have direct sunlight all day long, but a minimum of 6 hours is required for any productive vegetable garden. Weeds: One common suggestion when starting vegetable gardens is to avoid areas that have heavy weeds. This is all well and good when you have multiple locations that you can choose from, but not every gardener has that luxury. So what do you do if the best location you have available is covered with weeds? One of my favorite suggestions is to solarize the soil! Solarizing is a very simple technique where you use the sun to literally cook the soil to temperatures far above lethal levels for plant life and bacteria. It's a cheap way to "sterilize" the soil. You will typically want to do this in early spring, a few weeks before you are ready to start implementing your vegetable garden plans. You will need to make a trip to the hardware store to pick up some heavy mil black plastic sheeting, enough to cover the entire area you intend to garden. You don't need to til the soil or anything in advance, however a light watering is a good idea. Lay the plastic out over the garden area, and secure the edges using rocks or old lumber. It is very important to seal up the edges so the heat cannot escape from underneath the plastic, especially if you had to overlap multiple sheets to cover the entire area. Once covered you need only let the sun do its work over a period of several weeks. The intense heat of the sun on the plastic will raise the soil temperature far beyond that which any insects or plants can survive. This will kill off any grass or weeds that were present in the soil as well. Once this step is complete you can use a soil test kit to see how suitable the soil is for growing vegetables, and add any needed amendments before you til. 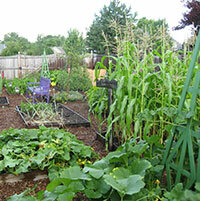 Water Source: Another important consideration in any vegetable garden design is watering. You won't always be able to rely on mother nature to take care of the water requirements of your vegetables, so make sure you choose a location that is within reach of a suitable water source. Drainage: As you are designing your vegetable garden plans, do not forget to consider drainage for your garden. You want to be careful not to place your garden in a low lying area that is prone to standing water or constant dampness. 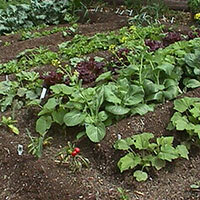 If the soil cannot drain adequately, it will spell trouble for sure for your precious veggies. If you are not sure if the location has suitable drainage, and your choices are limited on where you can grow, you can always consider raised garden beds instead of planting into the existing soil. 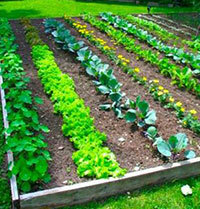 Raised garden beds are a great way to control the growing conditions for your vegetables. Since you are filling the beds with your own soil mix, you can customize each bed to the vegetables you are growing, and you can also ensure that your vegetable gardens have proper drainage. By using raised garden beds, the quality of the underlying soil becomes of little consequence and you can design the beds any way you please. Surrounding Plant Life: Before you go digging up and area to start implementing your garden plans, you should take the time to look around the area at the existing plant life. Now chances are you have already chosen your location carefully and moved it away from trees and shrubs, and any other plant life that might block the vital sunlight or use up the precious resources in the area. If your space is limited and you are forced to deal with neighboring plants around your vegetable garden, you will need to do a little extra research on the vegetables that you want to grow. Primarily you will need to know how big the plants will get at maturity as this will help you determine if you have adequate space for the number of plants you would like to grow. Don't be afraid to change your vegetable garden plans if the situation warrants. One of the biggest mistakes gardeners make is being too rigid in their plans. You have to remember it's the plants that need the right conditions, not you. If you go that extra mile and give them what they want, they will in turn reward you with what you are looking for.